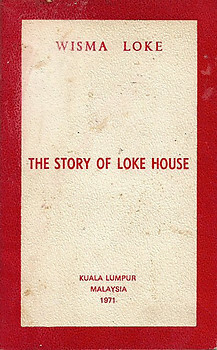 This is a booklet produced by the Loke Yew Trustees at a time when Loke House, or Loke Mansion, was open to the public. The book describes the architecture of the house and has a sketch of the life of Loke Yew, the leading Chinese businessman and philanthropist, who occupied the house in the late 19th and early 20th century. There are also references to restoration work being carried out at the time. Unpaginated, about 26 pages with several black and white plates Good Paperback. First edition. Published by Wisma Loke,Kuala Lumpur, 1971.. First edition. Condition: The cover has some dirt marks. The binding is tight and there is mild tanning throughout.